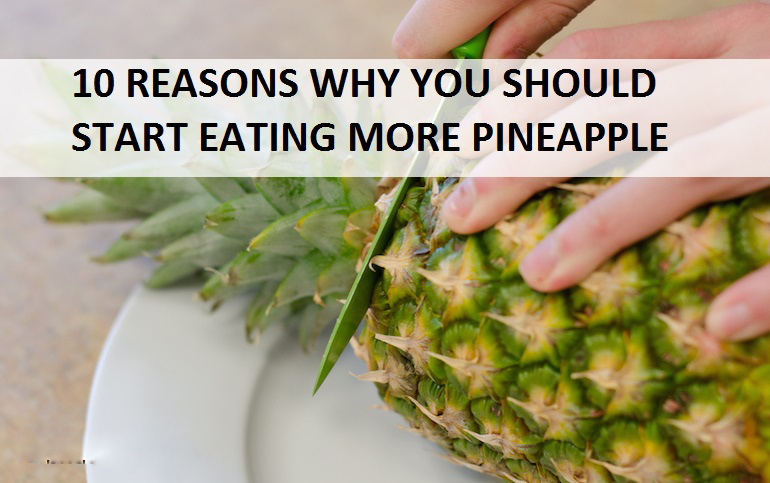 Pineapples are a real natural miracle and you should consider incorporating them into your daily diet. This amazing fruit is loaded with vitamin C and manganese, vitamin B1, folate, copper, vitamin B6, fiber, and pantothenic acid. The human body does not naturally produce manganese, so you need to consume it through foods. Pineapples are a rich source, and it will have a beneficial effect on the skin, strengthen the bones, and accelerate the healing of wounds. Due to the rich content of vitamin C, this fruit will prevent damage due to free radicals. As vitamin C is a strong water-soluble antioxidant, it lowers the risk of developing serious diseases and reduces the risk of cancer. Vitamin C supports oral health, lowers the risk of periodontal diseases and of gingivitis, and supports the ability of the body to fight toxins and bacteria that lead to gum disease. Being one of the richest sources of phosphorus, which builds up healthy bones and teeth, pineapples will dramatically support their condition. Namely, a cup of this fruit provides over 14 mg of phosphorus.